Washington Federal’s temporary branch is being set up at First and Baker. One downtown Albany bank stands empty while another is setting up a mobile unit to use as a temporary branch. 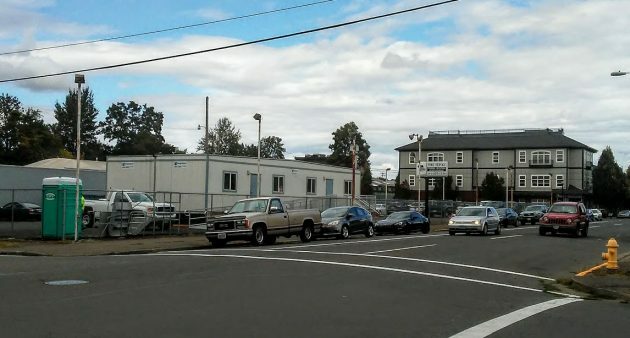 Contract workers have been setting up a 1,420-square-foot mobile home at 201 First Ave. N.E., a vacant former car lot at the corner of Baker Street. When you look at all the work — anchoring the thing to the ground, hooking up water and sewer, and so forth — it doesn’t look all that “mobile” to me. The Albany planning division approved a site plan for the unit on Sept. 4. The approval is good for a year and can be renewed for another year. Seattle-based Washington Federal told the city it expects to need the place for 18 to 24 months while it remodels its Albany branch, the former State Savings building at 300 Ellsworth St. I asked the branch manager in July about the reason for the remodeling, but she needed to check with headquarters, and nobody got back to me since. When I looked in the window a few days ago, the big Wells Fargo wall sign and the furniture were gone. Here’s a thought: If they knew another bank wanted a temporary office downtown, couldn’t they have made a deal? 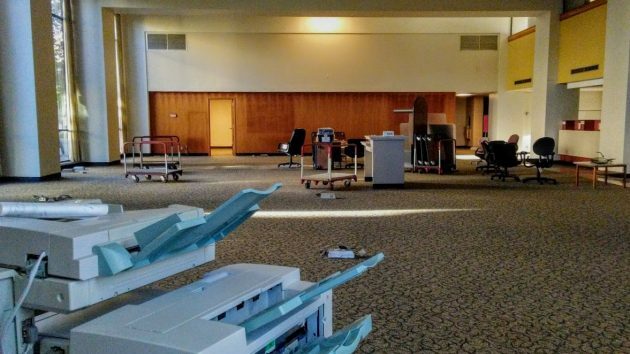 The cavernous interior of the former Wells Fargo bank on Sept. 9. I was just downtown yesterday to pick up food at Toki Terriyaki. I was impressed by how ‘spiffy’ downtown looked even with all the empty and mostly empty buildings. It’s too bad the new sidewalks, carrousel and all of those expensive, new hanging street lights can’t fill those buildings and create the tax revenue that the city proposed it would. We are pleased to see Mr. Engel thinking outside the box. Good morning Hasso. I was at an Open House for Pacific Office Automation in Salem last night and the building that they are now occupying was part of the Wells Fargo Bank. The address is 264 Liberty Street NE which in “historic” downtown Salem. Great use of the space. Yes–the City proposed great outcomes would result from spending millions downtown—another example of hollow ideas from even local gov’t. Tom Cordier head is just full of common sense! I love to read his letters to the editor! More, more, more of your common sense Tom! How about a temporary shelter for families? Salem turned an old nursing home into one and we need one as well. Wouldn’t it actually be safer and cheaper to temporarily house people in distress rather than dealing with all the problems that arise from the homeless population? It would certainly be more humane. Winter is coming.